The public outcry over this situation has finally led some in Congress to propose remediesv–vand we should support strict oversight of the runaway industrial farming and food production system that is responsible for illnesses and deaths among our citizenry. 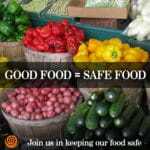 Anyone with an interest in food safety issues has probably seen or received emails charging that backyard gardens and organic farming would be outlawed by new food safety laws. We have closely read the proposed legislation, done extensive background research, and talked with the chief staff member responsible for the drafting of HR 875. Some have argued that this is a conspiracy promulgated by Monsanto and other corporate interests in conventional agriculture. It is our conclusion that none of these bills would “outlaw organic farming.” Other groups, such as Food and Water Watch and the organic certification agent CCOF have reached similar conclusions. But as we just noted, we need to be engaged in this process to protect organic and family farmer interests. Also, concerns have been raised that these new laws don’t examine meat safety concerns. The USDA is responsible for much of the nation’s meat safety regulations. It does not appear that Congress, at this time, is prepared to address deficiencies involving meat. HR 759, authored by John Dingell (D-MI), the House’s most senior member, is the bill that will be given priority by the House as they weigh food safety legislation. It proposes that all food processing facilities register with the FDA and pay annual fees, evaluate hazards and implement preventive controls of these hazards, monitor these controls and keep extensive records. HR 759 would give authority to the FDA to establish “science-based” minimum standards for the safe production and harvesting of fruits and vegetables. These food safety standards would address manure use, water quality, employee hygiene, sanitation and animal control, temperature controls, and nutrients on the farm. These high-quality, owner-operated, and often “local” farms are an important part of the solution to our nation’s food quality problems — not the cause — and they must be protected! It should be noted that unlike conventional farms, organic producers are already highly regulated in managing manure by composting and other requirements that dramatically reduce pathogenic risk. Spinach, tomatoes, peppers, almonds, and peanuts are in no way inherently dangerous. These fresh and nutritious foods pose a risk only after they are contaminated, which is why new food safety legislation must address the underlying causes of food safety hazards. 1. A thorough analysis of the underlying causes of food safety hazards. HR 759 proposes to regulate only fresh fruit and vegetable growers, setting minimum standards without requiring a thorough evaluation of the underlying causes of food safety hazards. However, HR 875 requires “identifying and evaluating the sources of potentially hazardous contamination or practices extending from the farm or ranch to the consumer that may increase the risk of food-borne illness.” Such an analysis could potentially identify aspects of industrialized/centralized agriculture and food processing as serious health threats. 2. HR 759 should establish categories for food (processing) facilities to ensure that smaller businesses are not disadvantaged by one-size-fits-all registration fees. 3. The final bill should also determine categories for ‘food production facilities’ (farms) — based on level of risk. These categories should differentiate between farms based on criteria including size and organic certification. A certified small-scale organic farm, as an example, selling its produce in the Community Supported Agriculture (CSA) model or through farmers markets or roadside stands should be regulated differently from a large-scale, conventional farm selling commodities to a national market. 4. Also, some small-scale farmers, including members of the Amish community, will find mandatory electronic record keeping requirements onerous and should be able to access alternatives, or be exempted due to scale. 5. At least one other separate piece of legislation, HR 814, would require a mandatory animal identification system (NAIS). Since the majority of all food contamination problems have emanated from processing, distribution, retailing, and food service, there is limited utility in requiring agricultural producers to go to the great expense of tracking each individual animal (any value from the system would mostly be applicable to animal health concerns, not human health). Since NAIS has caused a maelstrom of controversy in the farming community, Congress should debate this issue separately to avoid stalling the progress of critical food safety legislation. 6. Most importantly, the final bill needs to state clearly that food safety regulations should not interfere with any farmer’s ability to follow and comply with the regulations of the Organic Foods Production Act. Organic farmers are already audited and inspected on an annual basis. They already have a plan for their farm — an “organic system management plan.” The bill should specify that food safety regulations and food safety plans should not interfere with farmers’ existing organic plans. We urge you to contact Congressional leadership, and your own representative and senators, to make sure that the highest quality farmers in this country are not run over by juggernauts in Washington in their attempt to address the filthy industrialized food system that has sickened so many! Or you can call the Capitol Switchboard at (202)224-3121 and ask for your senators’ and/or representative’s office. Note: it is especially important for you to contact your Congressional representative if they are a cosponsor of the proposed legislation. For a sample letter you can easily personalize and modify to send to your elected officials, click here. Representatives Shelley Berkley (NV), Sanford Bishop (GA), Timothy Bishop (NY), Andre Carson (IN), Kathy Castor (FL), Joe Courtney (CT), Peter DeFazio (OR), Diana DeGette (CO), Eliot Engel (NY), Anna Eshoo (CA), Sam Farr (CA), Bob Filner (CA), Gabrielle Giffords (AZ), Rual Grijalva (AZ), John Hall (NY), Maurice Hinchey (NY), Mazie Hirono (HI), Eddie Johnson (TX), Marcy Kaptur (OH), Barbara Lee (CA), Nita Lowey (NY), Betty McCollum (MN), Jim McDermott (WA), James McGovern (MA), Gwen Moor (WI), Christopher Murphy (CT), Jerrold Nadler (NY), Eleanor Holmes Norton (DC), Chellie Pingree (ME), C.A. Ruppersberger (MD), Tim Ryan (OH), Linda Sanchez (CA), Janice Schakowsky (IL), Mark Schauer (MI), Louise Slaughter (NY), Pete Stark (CA), Betty Sutton (OH), John Tierney (MA), Debbie Wasserman Schultz (FL), Robert Wexler (FL). Representatives John Adler (NJ), Joe Baca (CA), Joe Barton (TX), Leonard Boswell (IA), Michael Burgess (TX), Dennis Cardoza (CA), Yvette Clarke (NY), Henry Cuellar (TX), Lincoln Davis (TN), Nathan Deal (GA), Eliot Engel (NY), Sam Farr (CA), Stephanie Herseth Sandlin (SD), Steve Kagan (WI), Collin Peterson (MN), Joseph Pitts (PA), Adam Putnam (FL), George Radanovich (CA), Charles Rangel (NY), Thomas Rooney (FL), Ileana Ros-Lehtinen (FL), John Salazar (CO), Adam Schiff (CA), David Scott (GA), John Shimkus (IL), Lee Terry (NE), Mike Thompson (CA), Greg Walden (OR).